HP photo paper is great for your everyday photo needs, whether you're arranging photographs in a scrapbook or framing them. This glossy photo paper with a 53-lb weight produces quality images while minimizing show-through. Brightens up your everyday photos. Sturdy weight reduces ink show-through and helps colors look more dramatic. Textured coating minimizes sticking when photos are stacked. Print more photo projects at home, using a low-cost, recyclable photo paper. 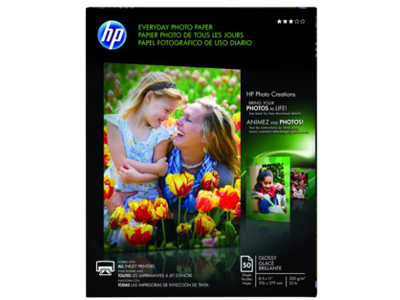 HP Everyday Photo Paper features a glossy finish for crisp, bright images on any inkjet printer. Plus, photos dry quickly for easy handling and quick sharing. Do more with your photos—use HP Photo Creations software to create photo cubes, newsletters, calendars and more. HP printers, inks and papers are designed and tested together for optimal results. Print photo projects, using an ideal paper for casual printing. This versatile, affordable paper makes it easy to print photo projects in the comfort of your own home. Share your photo projects right off the printer—prints dry quickly for easy handling. Pass projects around without smudging or smearing images. HP Everyday Photo Paper absorbs ink quickly, so you can use your photo projects right away. Rely on photo paper made from certified mixed fiber. HP Everyday Photo Paper is certified by the Forest Stewardship Council (FSC), which certifies the paper comes from an environmentally and socially responsible source. jim73: This paper gave me just the photos I was looking for. Printed well and dried fast. Irene52: This paper is great for printing wallet size photos for my scrapbooking projects. It ends up I pay less then getting 4x6 printed on line or at a store. Plus I can put all 9 photos on the same page.